Site managers don’t just face logistical challenges but diplomatic ones; when transforming sites into multi-home developments, instilling high standards while maintaining team morale is essential to getting the job done to award-winning standards. Cavanna Homes’ site managers Ian Crighton-Brown and Paul Whitlock have been recognised in the industry’s most prestigious awards scheme for their prowess in juggling these priorities while at the helm of two prominent Devon developments. 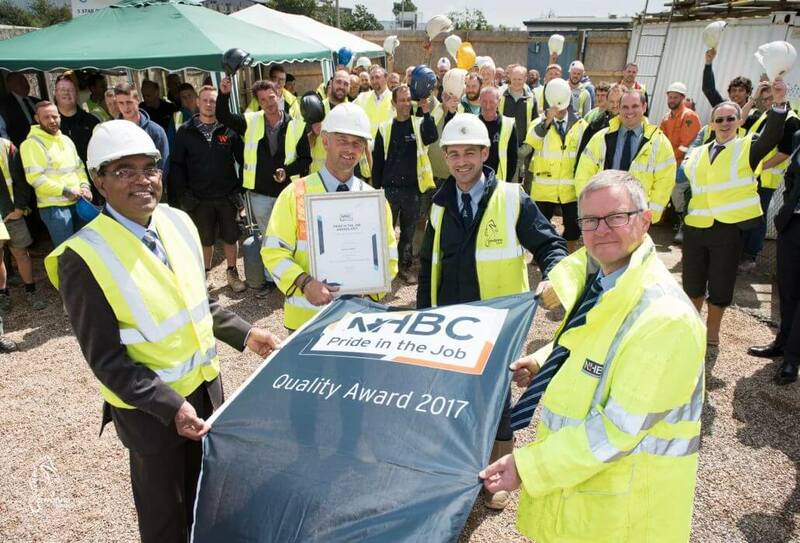 Both men have been awarded Quality Awards in the first round of the National House Building Council’s Pride in the Job Awards. Now in their 37th year, the awards recognise the exceptional contribution site managers make in creating high quality homes. Nationally, more than 16,000 site managers compete for the awards. All 2017 Quality Award winners will go through to compete for the Seal of Excellence and Regional Award Winner titles in September. 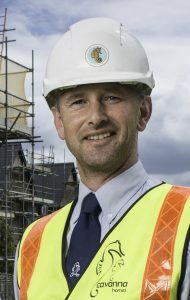 Paul, 43, who lives in west Devon, joined the family-owned Torquay based company in 2015 as site manager for Holsworthy’s 91-home development Market Quarter, a complex development presenting multiple challenges from the get-go namely, the need to produce a high-quality housing development from its former use as a cattle market. Paul moved down from the Midlands where he worked as a site manager for the start of the project. He said the biggest challenge was the need to level the dramatically undulating site prior to construction. Paul agrees that the challenges facing site managers don’t stop at practical ones, as it’s the team effort which is central to a successful job. “The biggest challenge as a site manager is that you’re just one man, and just one man can’t do everything,” he adds. “So it’s about setting the standards from the outset and getting everyone on site to buy in to doing it in the best way possible, and retaining the staff throughout. “I treat people the way I want to be treated. One of the most important elements is creating a team ethic – a we’re all in it together attitude. “Although the certificate has my name on it, it’s for everyone who works on the site, from the lad who sweeps the houses out to the man at the top. We’ve all got a role to play, and if everyone feels included and important than you’re more likely to get the best out of them. 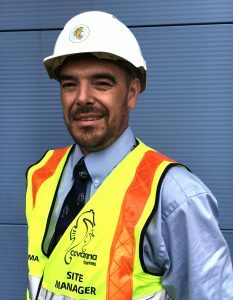 A DJ in a former life, Ian Crighton-Brown 47, from Teignmouth, joined Cavanna in 2009 as site manager on a small project and took on the role of supporting site manager at Cavanna’s flagship Plymouth 275-home development 504K, with lead site manager Ian Rankin who won the award in 2014. He took over from Ian at the helm of the project while also assisting with other Cavanna developments across the county. “My main objective on site is to make sure everyone has a safe working environment, is working to high standards and is happy,” says Ian. “I enjoy my job and thrive on producing a good quality product. I’ll only accept the highest standards from my team, but knowing the team is happy gives me the greatest satisfaction. “The award is an amazing achievement for me personally, but it’s recognition for my amazing team who all work well together, and particularly my assistant Guy Jary who has been a fantastic asset. Fred Sureshkumar, Head of Construction at Cavanna Homes, said both men take pride in their work and have worked well beyond the company’s expectations. He added: “Site managers play a vital role in the day-to-day operations of our developments, making sure things run smoothly and safely. “Everyone at Cavanna Homes works hard to ensure we’re building the best homes we can, and that starts literally, from the ground up, which is why it’s important to have excellent site managers. “Ian’s enthusiasm, drive and hard work mean he’s achieved very high standards and boosted customer satisfaction on the 504K project. “Paul has been very methodical in his approach to tackle the Holsworthy project; a scheme like this requires exceptional coordination and planning. 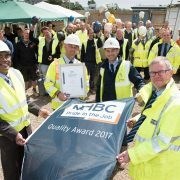 The NHBC regional finalists will be announced at an event at Sandy Park, Exeter, on Friday, September 15.